Kelly was born and raised in the Bearden and Fountain City communities of Knoxville, and graduated with a degree in accounting from the University of Tennessee in 2001. She moved to New York City in 2003 and has since also lived in Washington D.C., San Francisco, and Austin. It was during her time in New York that she was first exposed to the real estate world when she worked as a bookkeeper for a firm in Manhattan. She learned a great deal about the industry from the financial side, but ultimately she wanted to be out in the field working with clients. It was also there that she discovered a love for historical neighborhoods and their preservation. Kelly is a fan of all things vintage: from dance and music to fashion and culture. She grew up with a love for dance and was a member of the Tennessee Children’s Dance Ensemble, UT Dance Company, and Circle Modern Dance. 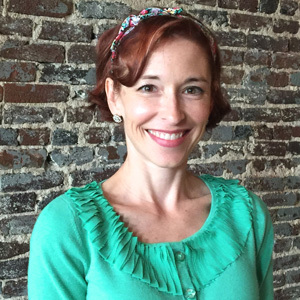 Over the past few years she has traveled all over the world teaching swing dance and is now a co-owner of K-Town Swing, teaching dance in Knoxville as well as hosting vintage-themed events. Kelly also has an affection for historical homes and the beautiful details they possess. She lives in the Happy Holler district of Old North Knoxville where she continues to work on her 1890’s Queen Anne. She is happy to be a part of First Neighborhoods Realty, and she loves to share her passion and knowledge of Knoxville’s historic communities with her clients. "Outstanding experience both selling and buying. Kelly knew our neighborhood (Oakwood-Lincoln Park). We had a contract above asking price (and far better than we expected) within 1 week. I've bought/sold 6 homes over the past 30 years. All went well with those and still, this was by far the best experience I've ever had with a realtor." "It was a long road. I was super picky, and Kelly was awesome...The only reason I got the house I did is because of Kelly. Very happy with her." "Kelly was great. She was proactive, helpful, patient, and trustworthy. I would have no hesitation to work with her again." "Kelly assisted, supported, researched, and routinely provided information and answered our questions in a timely, professional, and personable manner. Our Knoxville home purchase was accomplished from out of state making the process that much more stressful and complicated. Yet Kelly managed to soothe our nerves and simplify every step. We are grateful to have found her and highly recommend her!" "Kelly was great help to us as first time homebuyers. She was extremely knowledgeable, always available, and willing to help us save money and make the smart decision every time. We would recommend her to any of our friends and family." "The market was at a crazy and difficult time for buyers, but Kelly was patient and thorough. She always kept a positive attitude, even in our lengthy search. She responded timely to every need, until I found the right house at the right time!" "We couldn't have chosen a better agent! Kelly was pleasant, responsive, and patient throughout our home buying process." "Kelly is amazing! I would recommend her to everyone." "...we could not have asked for anything more in our agent, Kelly, and First Neighborhoods Realty. She was thorough, diligent, patient, gritty and ultimately helped us find and buy an amazing home..."
"Worked with Jade as well as Kelly. Absolutely fantastic experience! Very professional, knowledgeable and thoughtful. Thoroughly enjoyed working with them both. Would highly recommend either of these brilliant young women." "We are so glad we got to work with Kelly! As first time homebuyers, she helped us navigate the home-buying process, demonstrating knowledge, competence, and clear communication. She was immensely helpful and went out of her way to make sure we were being dealt with fairly by other parties. We love our new home, but if we had to buy another one in the future, we would call Kelly first." "Kelly was wonderful to work with. She made our first home buying experience seem like a breeze. We cannot thank her enough!" "We met Kelly when searching for our first home and we feel so blessed to have found her! She was patient and professional, answered all of our questions, and really helped to put us at ease during the entire process. We truly felt like she was our advocate and we couldn't have asked for a better experience." "Kelly was great to work with! She patiently showed us a handful of different properties in different areas surrounding downtown, and got better and better at 'narrowing in' on what we like. She was always responsive and thorough in answering questions, providing documents, and as we moved from 'looking' to 'buying' she walked us through the steps and forms very smoothly. We really enjoyed working with her and would be happy to recommend First Neighborhoods to friends." "Amazing! We would recommend Kelly to anyone! She made this process so easy, and she always made us feel like she was constantly working behind the scenes for us! She checked everything thoroughly and ensured we were making the best decisions. We are so thankful for the personable and professional character that Kelly has!" "Kelly was wonderful to work with in the purchase of our home. We contacted her on a recommendation from a friend, and from our first conversation, we could tell she was just as excited and invested as we were! Her sense of timeline and organization is on point, and her positive energy keeps everyone going." "Kelly was exceptionally tuned into the housing market in our area. Thanks to her knowledge, she knew exactly how to price our house. As a result, she received two offers on the first day on the market! I'm just glad I had the good sense to follow her advice and trust her judgment. She always quickly responded to my concerns and questions. She promptly followed through with paperwork and other necessary details at every step. I would highly recommend Kelly to anyone interested in selling their home." "After an unexpected hiccup, Kelly went far beyond the call of duty and helped us to secure insurance on very short notice so that we were able to still close on time. We are immensely appreciative of her effort." "Kelly was very helpful and patient with my boyfriend and I. We are first time home buyers and she walked us through the process and answered our many questions. I’m so glad we got to work with Kelly!" "Kelly was wonderful. This was a difficult transaction and she really worked to get it done." "Kelly was the perfect real estate agent to work with as my husband and I pursued buying our first home! She was knowledgeable, honest, and super easy to communicate with. We always felt like her priority and quickly came to trust her opinions." "Kelly is very organized and easy to work with." "Kelly really went the extra mile for us even though we weren't high-dollar clients. She was always professional and took the time to understand our needs and desires in a property. We were very well taken care of by First Neighborhoods Realty!" "As first-time home-buyers, Kelly was exactly what my wife and I were looking for in a realtor. She immediately responded to every question and concern we had and she helped us feel informed at each obstacle or decision we encountered...Kelly’s effective organization and communication paid off in helping us find our perfect home in the midst of a hectic market."